The second week for pupils staying at University College has been exciting and full of excursions, lessons and practical activities. A spooky stroll around Oxford in the dusky evening light gave students a fright earlier this week. Guided by an experienced and knowledgeable ghost hunter, the group set off in search of the city’s ghastly ghouls and troubled terrors. 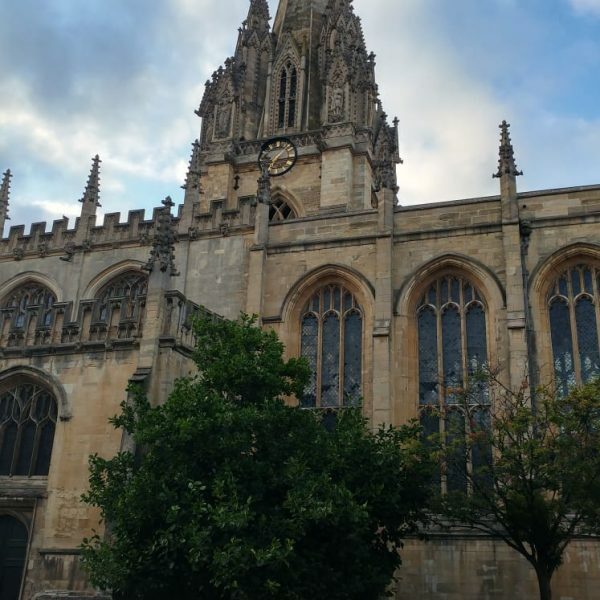 The excursion whisked pupils through the city centre and past many iconic landmarks as they heard all about the gruesome tales of Oxford’s bloody past. The stories and the twilight made for an eerie atmosphere as the group cautiously followed their guide to the spots of terrifying trials, haunting hoaxes and even spectre sightings. After such a terrifying excursion at the start of the week, it seemed only fair to take the students on a more relaxing trip to the Botanic Gardens. Founded in 1621, the Gardens have a long history of facilitating scientific research and education, as well as emphasising the crucial importance of plant conservation, with nearly 6,000 types of plant growing in the grounds today. The beautifully-kept Gardens mesmerised ORA students as they wandered past bright flowers, forest green leaves and twisting trunks. Some pupils took a particular liking to the Geographic Borders, a series of beds representing different biogeographical areas around the world: The Mediterranean Basin, South America, South Africa, New Zealand and Japan. The diversity of these beds and the regions from where they originate tell fascinating tales of their evolution, including animal foraging patterns and climate changes. Other students preferred gazing at the Medicinal Collection, featuring plants and herbs used in medicine to treat conditions. With informative signs emerging from the shrubs and plants, pupils were fascinated to discover how helpful these colourful and harmless looking plants can be to modern medicine. A bit of friendly rivalry is no bad thing, as the ORA pupils discovered in the Paper Aeroplane Competition. With a set of standard materials, it was up to the individual students to create their own aircraft masterpieces with the intention to beat their peers in a flying contest. The planes were quick to take shape, with some using traditional folding techniques and others opting for more technical additions, including landing apparatus and colourful badges. After the aircraft had been expertly crafted, it was time for the main event: take-off. Students each stood in the same position as they propelled their beloved aircraft into the air, watching with hopeful eyes and willing it to fly further than ever before. As each aeroplane took off, the cheers and sighs echoed with equal measure as a new winner would step towards the podium, only to be knocked out by the next contender. The chance to refine their public speaking skills was presented to ORA students at University later in the week, as they grabbed the opportunity to try and beat their peers at Yarnton Manor. The debate was a fascinating event that showcased the newfound skills pupils have acquired during their stay with ORA thus far. To read all about the debate, click here. Despite their final days with ORA approaching, there is still plenty to do before students return home. The chance to explore London, watch a West End show, go punting and Graduate are all lined up for pupils before the end of their trip, so check back soon to read about what they get up to.